Who needs the Big Bad Wolf? Ethanol Not Worth the Energy? There is a lot of debate about whether or not ethanol is worth it from an energy standpoint. The question is, does ethanol result in more energy being output than it what it takes to make the ethanol in the first place? A recent study says no. The Journal Star didn’t make a big deal out of the new report in this morning’s edition, but this is actually a very big deal. If ethanol is a net energy loser, than so-called “green” energy initiatives—such as the University of Nebraska–Lincoln’s switch to ethanol and biodiesel—are actually harmful to the environment and to taxpayers’ pocketbooks. If this report and others like it are true, you are paying the government to waste energy, and as a bonus you get to choke on a bunch of excess pollutants as well. p (including production of pesticides and fertilizer, running farm machinery and irrigating, grinding and transporting the crop) and in fermenting/distilling the ethanol from the water mix. Although additional costs are incurred, such as federal and state subsidies that are passed on to consumers and the costs associated with environmental pollution or degradation, these figures were not included in the analysis. subsidies, marketing, and direct endorsements. We can’t trust the government’s ethanol numbers any more than we can take at face value those from the industry itself. With so much at stake, and with so many people concerned about the issue, we need to force ourselves—and our policymakers—to take a long, hard, fresh look at ethanol policy. I didn’t make as much progress on Lincolnite this weekend as I had hoped. Oh well. It’ll just have to wait until I get back from Utah. I keep hacking away at Lincolnite in my spare time and I continue to make progress. I’m going to set a lofty goal for myself for this weekend: to have operability in the Articles, Blogs, Articles, News, and Directory sections. That doesn’t mean they will be finished, mind you. Just that the skeleton of functionality will be there. The Blogs are already at that point, so I can check them off. The News section is close, I’ve hardly touched the Articles section, and the Directory doesn’t even exist yet. Is it just me, or have there been more transients hanging around Downtown these past couple weeks? Having lived, attended school, and/or worked in and around Downtown since 1997, I’ve become pretty familiar with the transient population in Downtown Lincoln. I don’t know them by name or anything, but I can tell you which men have been around for a while, which ones I haven’t seen in a long time, and so on. There is always turnover, of course. But recently there seems to have been a sizable influx of new men hanging around. (Sizable is, of course, relative. I’m talking a half dozen or so individuals.) What makes them noticeable is that they don’t seem to “fit in”—they hang out in unusual places, for example. And most noticeably, they panhandle. The regulars almost never actively solicit assistance from the average passer-by. This new batch of transients hasn’t caused any problems to my knowledge, so their presence isn’t really something to be concerned about. But they have been noticed, not just by me, and not just by people who would be the type to notice these sorts of things. It really makes you wonder who these guys are, why and how they came here, and why they all showed up at pretty much the same time. In fact, that wonder may be a good thing. It may get the average Lincolnite to think a bit more about Lincoln’s homeless and transient populations. Or it may have negative consequences, perhaps scaring folks out of going Downtown. The Oven continues to impress me. I had been craving Indian food for a while, so The Missus and I went to The Oven last night on our weekly date night. The atmosphere, the food, and the service were all excellent as usual. I tried a new dish, chicken tikka madras. Oh my. I know very little about Indian food, but I know what I like. I really like chicken tikka madras. Most people would call the dish spicy; it was, but to my tastebuds it was nowhere near “oh my God call the fire department!” Nestled within, however, were several thin red chiles. Wow, they sure were fiery last night! The first one caught me off guard and gave me the hiccups. After that, though, I was prepared. They had a kick, but with a great flavor. I still can’t get used to some of the colors used in Indian cooking. The bright yellow mulligatawny and fire engine red chicken tikka still catch me off guard. As a guy coming from a pretty straight-up southeast Nebraskan-style cooking background it isn’t really surprising that the colors startle me. Growing up, the only bright colors I saw in my food were red (Heinz Ketchup) and yellow (Velveeta). But I’m learning! Yesterday’s Journal Star carried two articles that seemed to conflict a bit. Perhaps somebody can explain to me how the two situations jive with one another. On page 1B there was an article titled Hiker/biker bridge over North 27th planned. On page 3B there was Appeals court rules against city in bike trail. The LJS made no effort to connect the two stories. That strikes me as odd, considering the trail that the $1.76M bridge is a part of has effectively been cut off by the appeals court ruling. In other words, this new bridge will go…nowhere. The city could always reroute the proposed bike trail through the neighborhoods west of 27th Street. But that is, to say the least, a less-than-ideal solution. It could be argued that the bridge over 27th Street near Y Street is also valuable for your average pedestrian who just wants to cross 27th Street in a manner that doesn’t involve dodging cars. Fair enough, there may be a few of those people out there. But using a pedestrian bridge to cross a four-lane street requires traveling way out of your way. Most pedestrians are lazy. They will take the risk of crossing the street rather than walking three times the distance via the bridge. Consider 27th & Highway 2. Pedestrians who just want to cross Highway 2 on the east side don’t use the bridge, they cross Highway 2 (illegally) the old fashioned way. The proposed bridge won’t require going nearly as far out of the way as the Highway 2 bridge, but the principle is the same. nd it doesn’t serve any purpose for getting pedestrians across 27th Street, what is it good for? Not much, I propose. It strikes me as another silly—and expensive!—attempt to “pretty up” North 27th Street in a way that makes community leaders feel good about themselves without actually doing anything substantive to improve the neighborhood. In other words, the bridge runs the risk of falling into the same category as those silly—and expensive!—pseudo-antique street lamps in the area. Tom Osborne Field is ... Striped? Brian Rosenthal is reporting that Tom Osborne field is “colorful.” It sounds to me like he’s not a big fan of the new look. 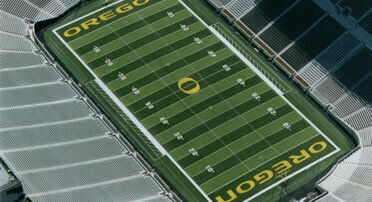 He compares the field to Oregon’s football field, which means it looks something like this. smoking ban went into effect.